KANSAS CITY, KAN. – Two months ago if you drove up to the Gapultos home in Russellville, Alabama you’d swear aliens had chewed off part of their cedar shake roof. Just 12 years after being installed, several shakes were missing, while others were curling up badly. The entire roof was faded, stained and had suffered hail damage. Now, after the installation of synthetic cedar shake roofing tiles from DaVinci Roofscapes®, the home’s exterior has been transformed. When Dr. and Mrs. Gapultos decided to replace their worn-out roof, they went to an expert — their daughter, Aimee Gapultos, for advice. 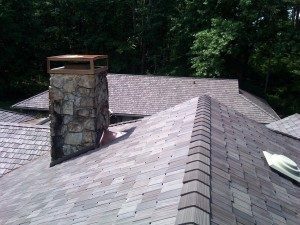 An architect with Wiser Company in Murfreesboro, Tenn., Aimee has had experience with specifying roofs. “The roof is a focal point in this home, so it was important to select a product that complements the structure’s natural stone and wood exterior facade,” says Gapultos, AIA, LEED AP. “My parents liked the cedar shake look but wanted to completely eliminate the potential for weathering and damage like they had experienced with real wood. Installed in a staggered application, the DaVinci Classic Shake tiles have dramatically enhanced the Gapultos home. “When I visited recently I couldn’t believe it was the same house I grew up in,” says Gapultos. “This new roof transformed the home and looks so natural.